Portable/Modular –We’ve worked with the most respected manufacturers in the industry, and we wouldn’t entrust your exhibit to anybody but the best. We guarantee that your exhibits are constructed with the highest quality materials and skill, and are protected by the best warranties on the market. Custom Exhibits – Innovation Exhibits has evolved from a portable modular distributor to a full-service custom exhibit designer and builder. 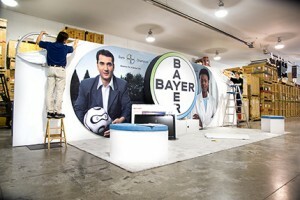 Our capabilities allow us to blend any portable/modular exhibit with our custom displays to meet your needs. Electronic amenities including lighting, audio and video are installed with care and precision to ensure full functionality, saving you costly errors on the day of the show. Prices for these materials have come down, so the cost is nearly equal to that of our standard product line. Plus, we guarantee that the green alternative line maintains ALL VERSATILITY, so our customers have just as many design options for their exhibits.